Christmas party season is well and truly in full swing and last night saw London's fashion cohort flocking to cosy The Lady Ottoline pub in Camden, North London, for the Love Magazine Christmas celebrations with designer Neil Barrett. In true Christmas spirit, 24 year old model Daisy Lowe arrived in festive fairy attire with large feathered angel wings to complement her silk satin camisole dress with tulle skirt and glistening Nicholas Kirkwood sandals. The ivory ensemble worn with tousled curls and red lips showed just how effective white and light tones can be in winter as she lit up the dance floor alongside singer Florence Welch who wore a daring sheer Marios Schwab pantsuit. Love is known for its naughty but nice approach to fashion, featuring as many of Editor in Chief Katie Grand's pets as they do scantily clad models. 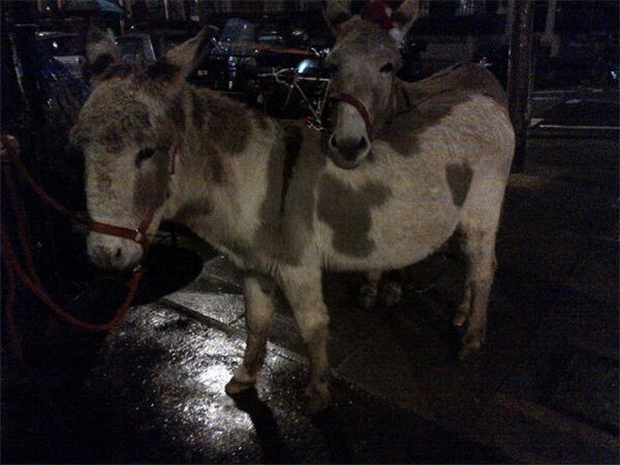 Last night was no different as guests were met by live donkeys as tweeted by @THELOVEMAGAZINE, arguably the most important of the eclectic guest list that also included Giles Deacon, Suki Waterhouse and Game of Thrones star Gwendoline Christie who joined Florence and Daisy for the soiree. Love is currently on day 18 of its raunchy advent calendar, revealing a different scantily clad lady in lingerie each day so there was no doubt some racy fun was had in the quiet night in at the pub last night.